Every robot geek wants to have a robot dog! or cat! The idea of having a robot that can run and jump like a house pet is intriguing. The Use Cases of Search and Rescue, Estate patrol, finding my shoes, and eating weeds in my yard, come to the top of the head. 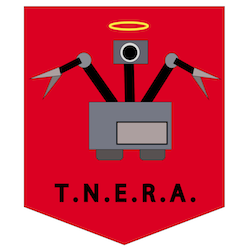 And a herd of robot dogs would be a key addition to any "Totally Not Evil Robot Army"! This is my attempt to build one using Maker tech and Urban Mined parts. The most excellent robotic researchers at the Biorobotics Laboratory (BioRob) have been doing incredible research in quadruped robots. BioRob is part of the Institute of Bioengineering in the School of Engineering at the École polytechnique fédérale de Lausanne - EPFL. In 2013, they started publishing their results of their research in dynamic robots using compliant mechanics. 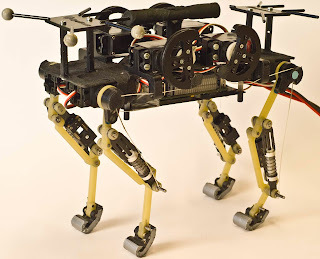 This included the Cheetah Cub - a compliant quadruped robot, the size of a house pet. The objective of this research is to explore how robotics can benefit from nature in the design and construction of the mechanics. One quickly realizes that the "static stability" of traditional robots, results in a very clunky design. For a robot to run and bound, it must have more dynamic properties. It must also find ways to conserve and use all of the energy produced by mechanics. This will introduce mechanical compliant systems to create flexibility and elasticity in the robot. BioRob was very successful in building the Cheetah Cub, and there are some good videos available of it walking, trotting, and bounding. BioRob has gone on to build a few new variants allowing for steerage, etc. In order to promote this concept more, it is time for the Makers to get involved and try to replicate the success and evolve the design if possible. My next project was planned to be a Hexapod robot. 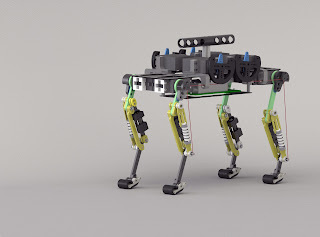 But after reading about EPFL - BioRob's success and seeing the OpenCat project, I had enough inspiration to try for the compliant quadruped. Besides, I am really cheap when it comes to buying parts, a Hexapod requires 6x3 = 18 servos and a quadruped like this would only need 4x2 = 8 servos! (in theory). And dynamic is way more exciting than static! A static 3D printed Hexapod leg vs the sketches of a compliant leg.